I had a great time at the party last night. Finally, it must be midnight. It’s so dark I can’t see a thing. Thanks Lexie and Mica. I hope you and your family have a wonderful year. Thanks Patrecia. 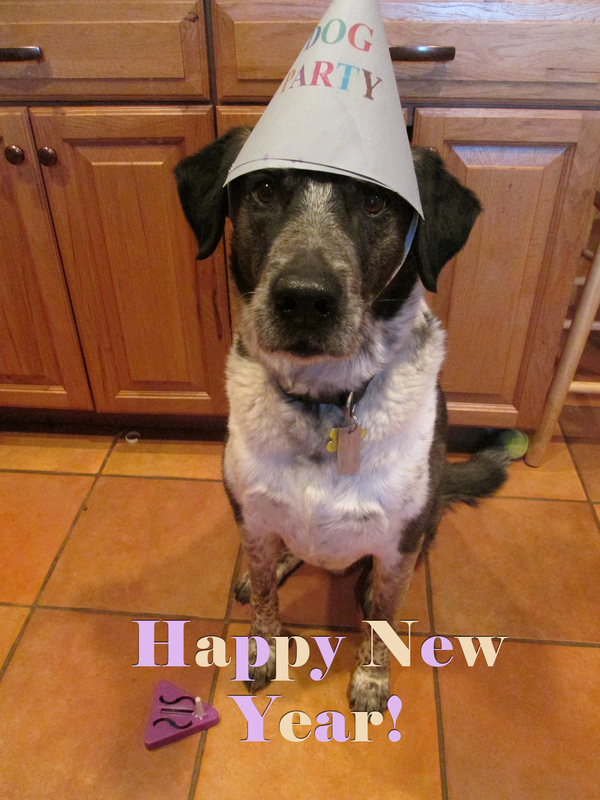 I hope your year is awesome and I’ll try to do lots of investigations this year with my Detective Dog hat on. Thanks Little Binky. And I hope you and your granny and grandpa have a wonderful year. How do you put up with them putting that stuff on you ? It would be humiliating. Hope you got a treat for being a good sport. Fredrieka, the only reason I put up with the hat is because my person puts a treat in her pocket first. Then she gives it to me after she takes the pictures. Happy New Year! Oh sure I would do it also. Thanks Misaki. Same to you. Kolytyi, I wish it was what you said. It was only me, Scratchy, and my people at the party. 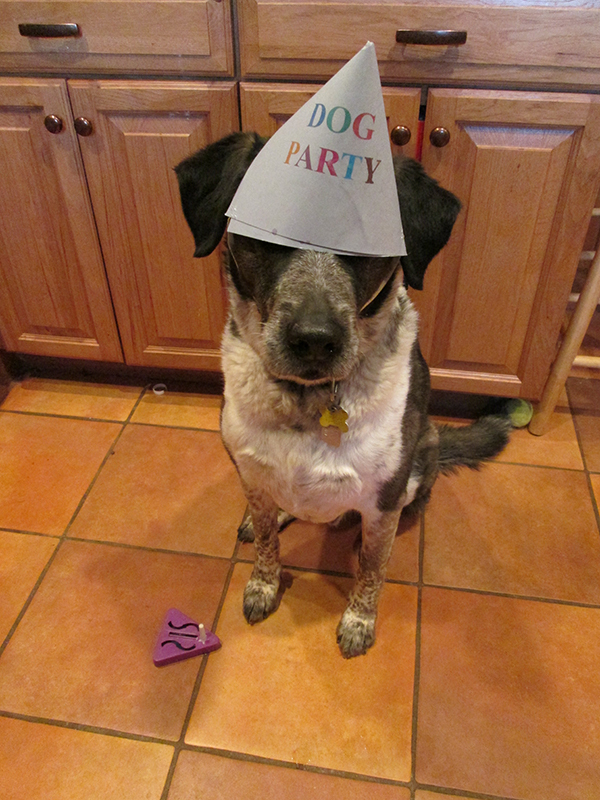 I’ll have to remember to send out invitations to all my dog friends next year. Happy New Year to you! Thanks so much Kevin. 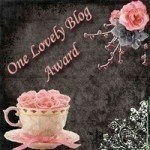 I so love chatting with you on my blog. I wish you the best year ever! 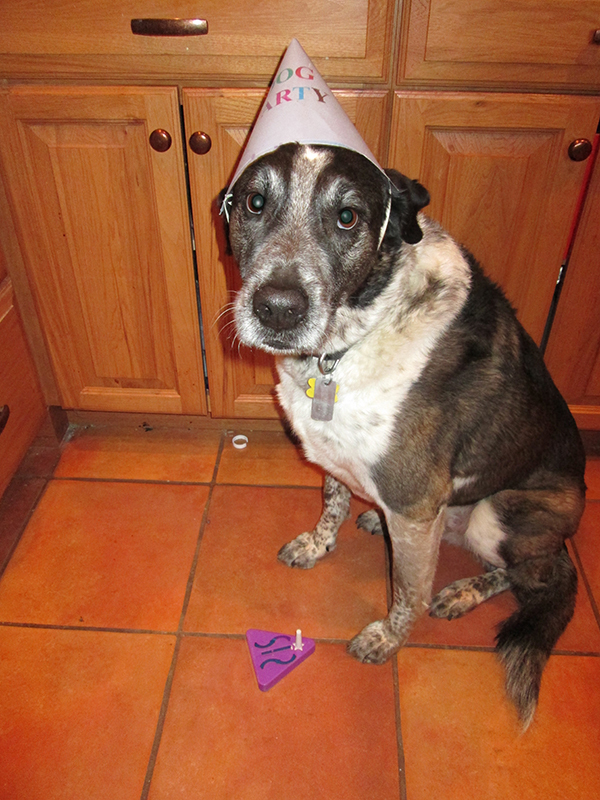 Happy New Year, my dearest doggy Bongo!!!! May 2014 bring joy to all your family and abundance of fish to you and silent thunder!!! 🙂 Big big kiss from your friend! Thanks so much Marina. I hope you have a really blessed year too. Sometimes, when I’m wearing a hat, the lights suddenly go out, too, B. there’s something dangerous about hats, I think…..
Cupcake, I don’t know what it is with hats, but you’re right. There’s something dangerous about them. Hi Nel. It’s been a long time. Happy New Year to you too! Hi bongo! happy new year back! I love your funny stories bongo! So glad you enjoy them Quinlyn. My person says she has to laugh or she might cry at some of my mischief. I’m not sure what she’s talking about. Thanks Lily. I hope your year is totally blessed. Thanks so much Kari. I hope your year is awesome. Thanks Bassa. And Happy New Year to you and all your family too. Huge kisses and hugs for you. Thanks so much YouKai. I hope your year is wonderful. Drink lots of water if you’re hung over Bongo…you didn’t over-do it & party too hard did you? Lola, I was a good boy. I didn’t even drink any of that sparkling cider stuff. Looking forward to another year of your stories, Bongo! Happy 2014!! Thanks Jackie. And I hope you have a great year.